Cleckheaton return to action this weekend with a trip to West Leeds, which begins a spell of three crucial fixtures in their quest for survival in North One East (kick off 2.15pm). The Moorenders go into the game lying fourth-bottom in the table, just a point above Bridlington, having lost their last four matches. West Leeds are second-bottom — 11 points behind Saturday’s opponents but with a game in hand after last week’s rearranged fixture against Morley was postponed — and they know completing a league double over Cleck will be crucial to their own survival hopes. With matches against the sides directly above Cleckheaton, York and Pocklington, to follow it is certain to be a key period for Thiu Barnard’s men as they aim to pull clear of trouble. Cleckheaton have produced determined performances without reward in recent weeks as they suffered defeats to the top three sides during a tough period. West Leeds produced a dramatic fight back to win 34-31 at Moorend on October 20 after they had trailed 31-22 late in the game. Winger Alex Brown bagged his first try for Cleck that afternoon during a brief spell with the club but he has since returned to rugby league where he joined Championship side Dewsbury Rams. Player-coach Barnard, James Wilson, Mikey Hayward and Tom Mobbs were the other Cleckheaton try scorers as they saw a long unbeaten home record ended by their West Yorkshire rivals. 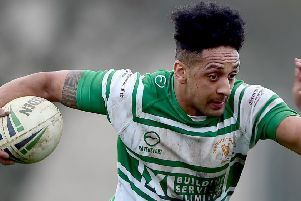 West Leeds have won two and lost two of their matches in 2019 and know victory over Cleckheaton will give their survival hopes a real shot in the arm. Cleck entertain ninth-placed York on February 16 and then visit Pocklington, who are 10th, on March 2 when the kick offs revert to 3pm.